Stephen Connon was born in 1976. He received his B.Sc. from Dublin City University in 1997 and his Ph.D. from University College Dublin under the supervision of Prof. A. F. Hegarty in 2000. After being awarded an Alexander von Humboldt fellowship he spent two years at the Technische Universität Berlin with Prof. S. Blechert, studying the design of new olefin metathesis catalysis. In 2003 he was appointed to the staff of Trinity College Dublin and was elected a fellow of TCD in 2007. 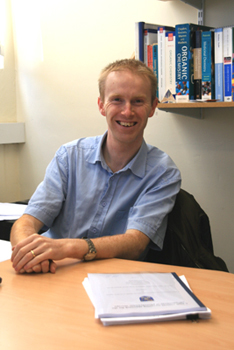 In 2008 he received a European Research Council Starting Grant Award and was promoted to Senior Lecturer. In 2010 he was appointed Associate Professor and later that year Professor of Synthetic Chemistry. His research interests include organocatalysis, the discovery and development of novel synthetic methodology and the design of new anti-cancer and anti-bacterial agents.